I have to be honest with you - post New Year's is my least favorite time of the year. The holidays are over, the weather is awful and summer seems a lifetime away. But the silver lining to this is that all the spring collections are slowly starting to trickle in and it's brightening my spirits. I'm not a pastel lover most of the time, but surprisingly I can't pass it up when those first few spring launches hit the counter. There are a ton of new arrivals at Sephora, and I love how Bloomingdale's has a page just dedicated to the new spring makeup lines. After scrolling through a ton of new releases over the past week or two, here is a look at some products I am dying to try, and a few old ones that are currently on my wish list. 1. Clarins Lip Comfort Oil - I do love a full coverage lipstick, but this new lip oil concept that has hit the market intrigues me. These Clarins Lip Oils (as well as the new YSL ones) seem like they would be heaven on the lips - especially during a time of the year when my lips could use the moisture! 2. Charlotte Tilbury Filmstars on the Go - After finally trying a few of Charlotte Tilbury's products (read that post here), I am excited to add a few more to my collection. These new cream eye and cheek combos seem perfect for using when I travel or on a morning when I hit the snooze button too many times and need to dash out the door. 3. Byredo Black Saffron - Though I have way more fragrances than I could ever use, I am always on the lookout for a new one. Whoops. I have heard rave reviews about this scent from Byredo, and was anxious to test it out during a recent trip to Barneys. After the first spray, I was not impressed and then 20 minutes later the scent settled on my skin and I was hooked. It is by far one of the most unique scents I have ever experienced and I think it will need to be my next fragrance purchase. 4. Dior Kingdom of Colors Vernis and Blossoming Top Coat - Either it's Chanel or Dior that comes out of the gate at the beginning of the year with great spring nail shades - and this year I prefer Dior's offering. The confetti top coat seems like it may be a pain to take off, but I can't resist that sea foam green shade! 5. NARS Dual-Intensity Palette - I am embarrassed to even admit this, but I did not purchase any of the NARS Dual Intensity shadows when they first launched. There are too many makeup launches constantly occurring, and my budget only allows for so much! But now that NARS has released a palette of this formula, I think I may have to pull the trigger. 6. Guerlain Ecrin 4 Couleurs in Les Precieux - I am already a huge fan of Guerlain eye shadows (well, Guerlain anything to be honest), and am loving their recent release called Les Sables. So naturally when they released their new spring collection, I was instantly drawn to this palette. I am not sure if it's the new embossing they are doing, or the array of colors, but I know I must have it! 7. Jo Malone My Wanderlust Cardamom and Morrocan Rose Candle - I've been on a Diptyque candle buying spree recently, picking up this one from holiday and this one with a recent gift card, but I was drawn immediately to the jar of this Jo Malone candle. I have never tried Jo Malone's candles, but I hear such rave reviews so I believe they are as superior as Diptyque. 8. Laura Mercier Infusion de Rose Nourishing Oil - It's the dead of winter and face oils are a must for me right now! I have been using this one from Sunday Riley to help minimize breakouts, and think this new one from Laura Mercier would be great to add to my routine. It's designed to help replenish moisture and nourish the skin which is exactly what I need this time of year. 9. Perricone MD Blue Plasma Cleansing Treatment - If you are new to this blog, then I should probably catch you up to speed. I am obsessed with the original Blue Plasma. It is a holy grail product for me, and gives my skin the most amazing results when using regularly (read my review here). So when I heard there was a new Blue Plasma cleansing treatment, I knew I needed it yesterday! It helps to purify pores by removing debris while still keeping the skin hydrated - and doesn't that sound like something we could all benefit from in our routine? YES IT DOES. 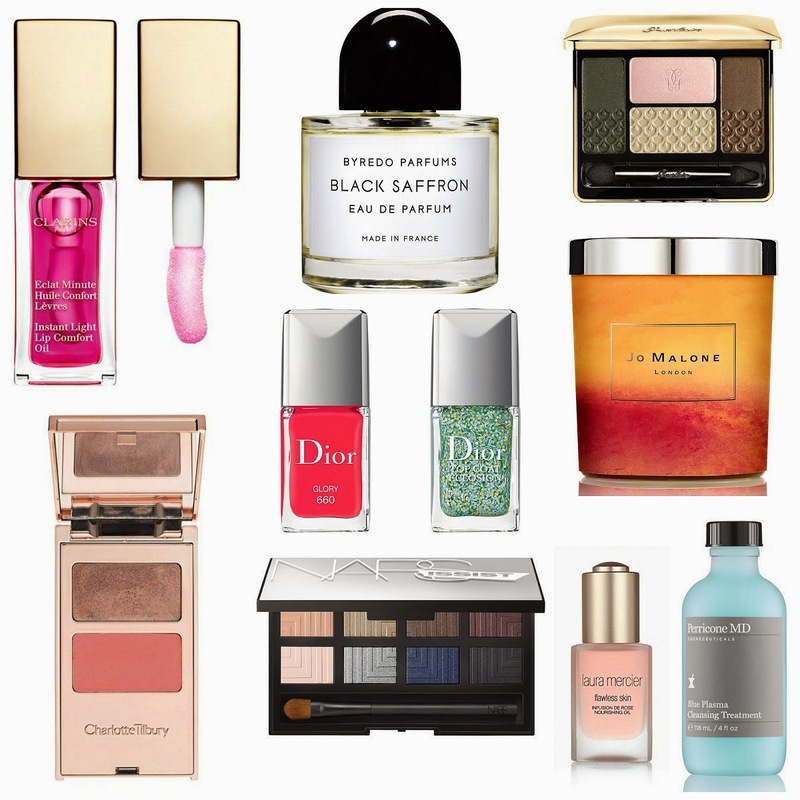 What's currently on your beauty wish list?